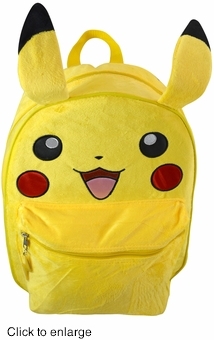 Any Pokemon trainer will love to be seen around town with this super cool Pokemon Pickachu plush backpack with wire bendable ears. This awesome Pokemon backpack is made of bright yellow plush fabric. Equipped with its an embroidered and sewn Pickachu face and black tipped ears (which you can easily bend to give Pickachu different looks) appears exactly like the adorable formidable Pickachu. The Pickachu backpack has a main compartment that expands to 5 inches deep and a front smaller pocket with a cool lighting bolt zipper pull. The Pickachu plush backpack is 16 inches tall(ears add another 6 inches) and 12 inches wide and has adjustable arm straps.